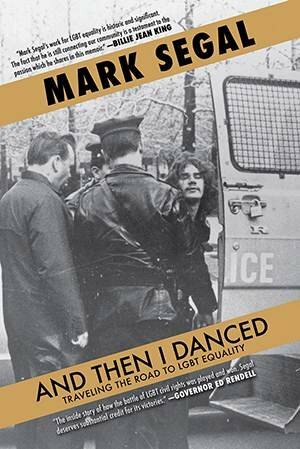 Publisher of the Philadelphia Gay News, Mark Segal, had something of a moment of serendipity recently during a launch party for his new book, And Then I Danced, at 30 Rockefeller Center in New York City. It was an interesting moment, he said, as three decades ago, he was dragged out of the building by security. "That's the same building that, 30 years ago, I was taken out in handcuffs," he said, during a recent interview. Segal was arrested Dec. 11, 1973 after barging in front of cameras on The CBS Evening News with Walter Cronkite, with a sign that read "Gays Protest CBS Prejudice." He had talked his way into the studio saying he was a student journalist. It wasn't Segal's first or last arrest for his activism in promoting LGBT rights in America. In fact, he said, in looking back at his life while writing his memoir, Segal found the receipt from his first arrest for being an activist. "There's a picture of it in the book," he said. As a life-long LGBT rights activist, Segal has plenty of stories to tell of working to support the gay community, but, at the age of 64, why was the time right to share the story of his life? Segal said that he decided get writing after what he called the first "officially stamped LGBT friendly" senior living complex in the country opened in Philadelphia. Segal said he worked hard to help bring the John C. Anderson apartment building, a 56-unit, six-story senior living complex on 13th Street in Center City, to help support LGBT seniors. "We wanted to take care of our seniors. I'm proud to say, we did that," said Segal. But, once the project was complete, he said, friends began pushing him to write his life story. It was a tricky prospect, Segal said, as he's not usually reflective of his own achievements. "You move forward without looking back until you do something like this," he said. "But people were pounding on me, 'It's time to write your history.' "
And how he began the Philadelphia Gay News in 1976 as a subsidiary of a gay newspaper in Pittsburgh. "I never imagined the enormity of the projects I've been involved in until I started to write," he said. Yet, he said, he also wanted to share the story of his youth, growing up in what he called the only Jewish family in a South Philadelphia housing project in the Fifties. "I got anti-semitism from day one," he recalled. His parents were very supportive throughout his life and they gave him the confidence that he would need to help fight oppression as an activist throughout his young life, Segal said. With the laundry list of Segal efforts to promote equality, one might compare him to Harvey Milk, the first openly gay politician elected in America, whose story was portrayed in the 2008 film, Milk. But Segal rejects that comparison as he has fought for gay rights his entire life, while, he said, Milk wasn't open about his sexuality until he was in his 40s. Recalling the first gay pride parade in New York City, held in 1970, Segal said he proudly marched while Milk, who lived in New York City at the time, did not. "Harvey wouldn't come out for the first gay pride parade," he said. Michael Dennehy, who edited Segal's book, also edited The Mayor of Castro Street, the book that the Milk movie was based on. In preparing a first draft of his book for Dennehy, Segal said he worried his life story wouldn't be credible. "I read the first draft and I thought 'no one's going to believe that one man did all this'," he said. Segal said the book is "joyful," full of the many "firsts" in his life – from being part of the Gay Liberation Front and establishing "a gay community where there was none before," to his invitation to the White House, where he danced with his now husband, Jason Villemez – a moment that inspired the book's title. "It's a story about me learning," said Segal. "And, I think, the book is full of joy." Asked about his life in Philadelphia, and the efforts that he and others have taken to make the city more LGBT-friendly, Segal proudly trumpets Philadelphia as the "most LGBT-friendly city in America." "We have the strongest LGBT laws in the nation," he said. "We outshine the rest of the nation...And, our gay men's choir is spectacular." Segal touted the city's LGBT community, which has worked "brick-by-brick" to help make Philadelphia more gay-friendly than comparable cities, like San Francisco or New York City. "I love my city...I'm really proud of our community to get us there," he said. "My memoir might be about me, but it's also about the community and all we have done." Segal's memoir, And Then I Danced, was released Oct. 6 and is available at bookstores and online retailers, including Amazon.